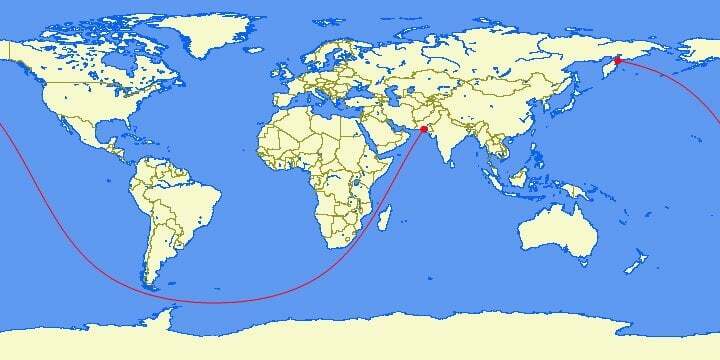 Have you ever wondered what is the longest straight line a person could travel on the ocean without hitting land? One user on the Reddit site started a huge debate on this question and now scientists have an answer for it. The question originally appeared in 2012 on Reddit. A user known as kepleronlyknows revealed a map of the world which would show the longest straight line course that a person could travel on Earth, an overseas path that was more than 19939.6 miles long. It ran from southern Pakistan to northeastern Russia. There were people on the thread that tried to prove that the user was right or wrong, while a number of users discussed possible ways to travel on land in a straight line without hitting a large body of water. The line on a map, however, seems curvy rather than straight. So, kepleronlyknows also shared a video that explains the line using Google Earth. After they saw the debate, computer scientists Rohan Chabukswar from the United Technologies Research Center in Ireland and Kushal Mukherjee at IBM Research India decided to test the claims. Furthermore, the claim from the Redditor kepleronlyknows was correct. They published their findings in an open-source pre-print server arXiv.org. The researchers used data from the National Oceanic and Atmospheric Administration’s Global Relief Model of Earth’s surface. That system displays Earth’s surface showing the whole planet at a resolution of 1.1 miles. According to the Newsweek, one way to discover the longest straight line without hitting land is possible by checking every possible great circle, one of the imaginary circles that are present across the maximum distance around a sphere. However, at a resolution of 1.1 miles, there would be more than 230 billion great circles which would need to be looked at, which takes a lot of time to compute. That encouraged Chabuskwar and Mukherjee to make an algorithm which is based on a method known as “branch and bound.” They used this method to find the path faster as they made optimizations in the search for solutions. “The algorithm returned the longest path in about 10 minutes of computation for water path, and 45 minutes of computation for land path, on a standard laptop,” the researchers wrote in the study. Visually, the results of the two researchers were the same as the line made by kepleronlyknows. The path starts in Sonmiani, Balochistan, Pakistan, and then travels between Africa and Madagascar. It continues towards Antarctica and Tierra del Fuego in South America and finally ends in Karaginsky District, Kamachtka Krai, Russia. The team didn’t stop there, but also calculated the longest straight line over land. Their path starts close to Jinjiang, Fujian in China and ends close to Sagres in Portugal after it travelled through Mongolia, Kazakhstan, Russia, Belarus, Ukraine, Poland, Czech Republic, Germany, Austria, Liechtenstein, Switzerland, France, and Spain. The line extends 6984.8 miles. The team also wrote that the problem was seen from a mathematical point of view and they don’t recommend that someone sails or travels on the paths that they calculated.